Today Is My 4 Year Bloggoversary! 4 years? I can't believe I have been writing about my home improvement endeavors for FOUR YEARS!! Why isn't my house finished yet? Kidding.. kidding.. This is actually house number three (four if you count our 6 month corporate rental) in the 4 years I've been blogging. If you never read this post about how my whole "DIY blog" journey began (and an explanation of how we went from house to house to house), you totally should. This blog all started almost as joke.. as I banged my head against the wall trying to sell one house and then trying to fix up the next horrible money pit. I just wanted to share it with people I knew in real life. I used the standard blue blogspot background, slapped in some teenie-tiny poorly lit photos and called it day. But then those people started sharing my posts with people they knew.. and soon STRANGERS were reading my blog! I can keenly recall the first time someone told me that a friend of theirs (someone I didn't know) had mentioned something they saw on my blog. I just about peed my pants with excitement. getting them excited about things I was excited about was invigorating. I quickly taught myself a little HTML, bought my URL, got a free blog template, and tried to put everything in some semblance or order. Yes, I have had highs and lows. I have survived huge changes I never would have predicted. I have done things and met people I never thought I would. I have gone outside my comfort zone, and I am better person because of it. But even if all my readers went away today.. I still would do it, because I have grown to love it it. Today, 4 years in, I can say I HONESTLY love blogging. I'm not in it for the money obviously! What a crazy 4 years it has been! And you want to know something even CRAZIER?! 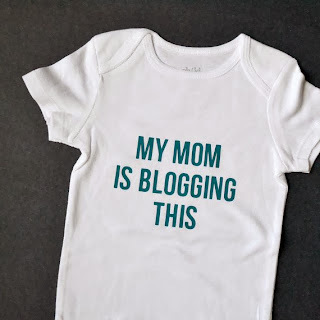 I have a little secret I have never mentioned this on my blog before: Prior to being a DIY blogger, I actually blogged under an anonymous pseudonym (about work-life balance and the trials of tribulations of being a working mother) for 2 years. That blog is LONG GONE, but it would make this my SIX YEAR bloggoversary! It also means I am an 'old timer' by blog standards. Boy the blogging world has changed. Nowadays there is no lack of great content and it is easier than ever to find it. The blog world is HUGE but there still is room for everyone. If you have a passion.. and you want to write about it, share it or just connect with other people who love the same thing that you do, then GO FOR IT. Don't be afraid! I have heard so many people say "I haven't gone live with my blog since it isn't ready." Trust me.. you will never be 100% ready. Just jump in. It doesn't matter if every project doesn't go exactly as planned, every image isn't Pinterest worthy or that you don't have 1000 followers on every social network. Hit publish already!! And most importantly, don't waste time comparing yourself to others and thinking that you can't do something as well as someone else. I follow a lot of big bloggers that I love and admire and it took me a long time to stop constantly comparing myself to them. They seemed to have it all together while I was barely keeping my head above the laundry pile. But the truth is that they are regular people, just like me. My goal is no longer to "be like them" but to "be INSPIRED by them" so that I can be better at being ME. Everyone has their own voice, their own style and will fit their own niche. Your goal shouldn't be to be a copy of someone else. 4 years ago my blog was nothing like it is today.. and 4 years from now it will be really different. It will be BETTER. You only get better at something if you actually DO it.. work at it, practice it and learn from it. Before this blog I had never picked up a nail gun, or used a electric saw. I barely owned a hammer.. and now I am asking for power tools for my birthday. This blog has forever changed me as a person. And so I want to thank everyone who has stuck by me. People I know from the EARLY EARLY days, people I only recently connected with and people who are just passing though. I would still be blogging even if nobody was listening, but you guys sure make it a lot more fun! Thank you for the many 'bookmarks' I have based on your DIY experience. Congrats and keep it up! FOUR MORE YEARS! FOUR MORE YEARS! Well said and done, Congratulations Kim! Ha ha ha.. You are too funny!! Congratulations on your 4 year bloggoversary! I love how blogging allows me to meet people from all over and to be inspired. I look forward to what you have in store for 2014.